I wanted to create an afghan for my first grand baby that would be both colorful and had a lot of texture. I chose the large flower blocks because of their layering. 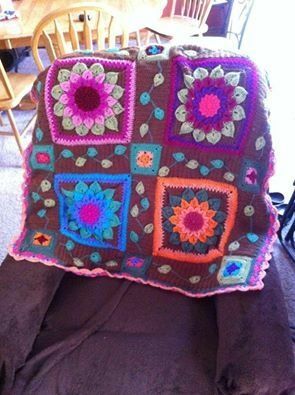 I then designed the borders to mimic the flower petals and create motion in the afghan. I topped it off with the corner squares in a simple pattern so as not to take from the flower’s beauty. Beautiful Afghan, very nice flowers! Sorry this isn’t a scarf. I posted to the wrong board. What a bummer. this just makes me want to smile! !